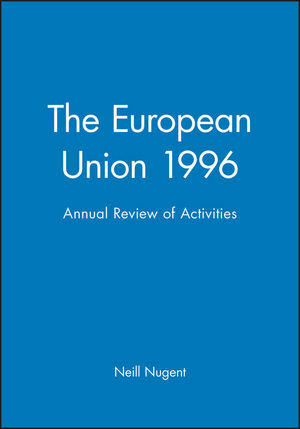 This well established Annual Review, which is produced in association with the Journal of Common Market Studies , covers all key developments in the European Union in 1996. Neill Nugent is Emeritus Professor of Politics at Manchester Metropolitan University, UK. He has published widely on the European Union and in 2013 was given a Lifetime Achievement Award in Contemporary European Studies by the University Association for Contemporary European Studies - UACES - 2013. 1. Editorial: Preparing, Waiting and Hoping: Neill Nugent (Manchester Metropolitan University). 2. Keynote Article: 'Mad Cows and Englishmen' -The Institutional Consequences of the BSE Crisis: Martin Westlake (European Commission). 3. Governance and Institutional Developments: Richard Corbett (European Parliament). 4. Internal Policy Developments: John Redmond (Birmingham University). 5. External Policy Developments: David Allen and Michael Smith (Loughborough University). 6. Legal Developments: Jo Shaw (Leeds University). 7. Developments in the Economies of the European Union: Andrew Scott (Edinburgh University). 8. Developments in Member States: Brigid Laffan (University College Dublin). 9. A guide to the Documentation of the European Union: Janet Mather (Manchester Metropolitan University) and Ian Thompson (University of Wales, College of Cardiff). 10. Chronology of Key Events: Neill Nugent (Manchester Metropolitan University). 11. Books on European Integration: Brian Ardy and Jackie Gower (Thames Valley University). * The most up to date and comprehensive guide available to events in the European Union. * Expanded to include a section on legal developments.